July | 2015 | Arthur in the Garden. Time for a new mower and it is Peach season! After 12 years of service the lawnmower has finally died! The blade was duller than an old razor and the choke had even broken and I had to use a plastic tie to keep the choke on to cut the grass. 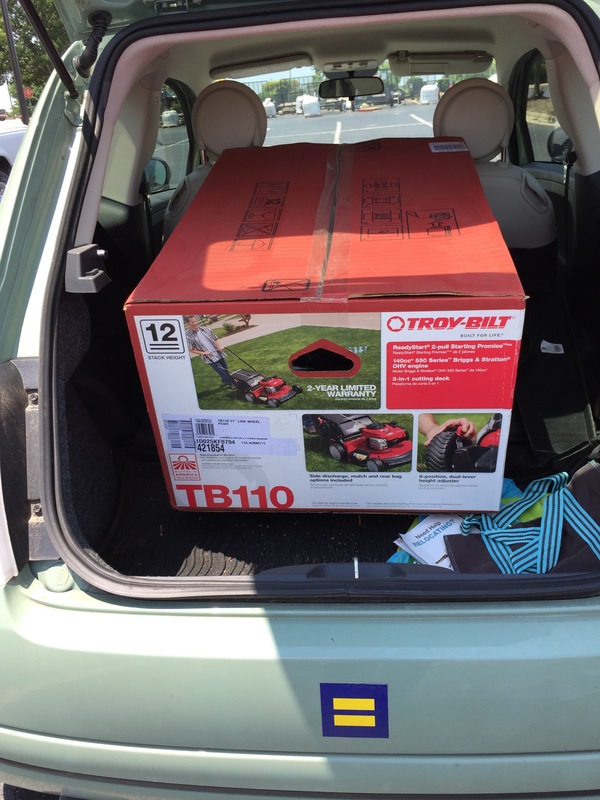 Of course, it was not until I had purchased a new mower and was heading to the Fiat that I even gave a thought about it fitting in the back! It did! The dog days of Summer are here! Hot, steamy and humid here in the Mid-Atlantic States. I miss the breeze we have on the coast which very much reduce the effects of the humidity. Most of the garden is enjoying the hot and humid days as long as I water daily. 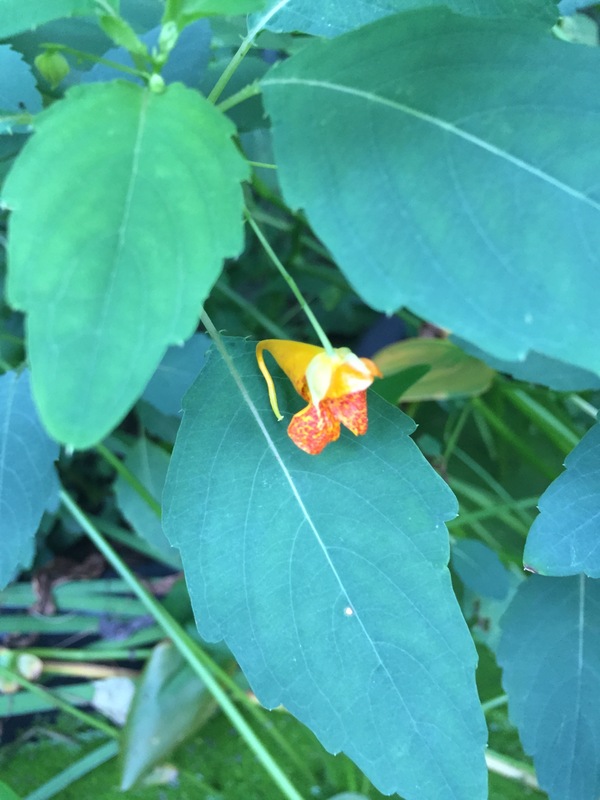 A new plant for me this year is Jewel Weed. 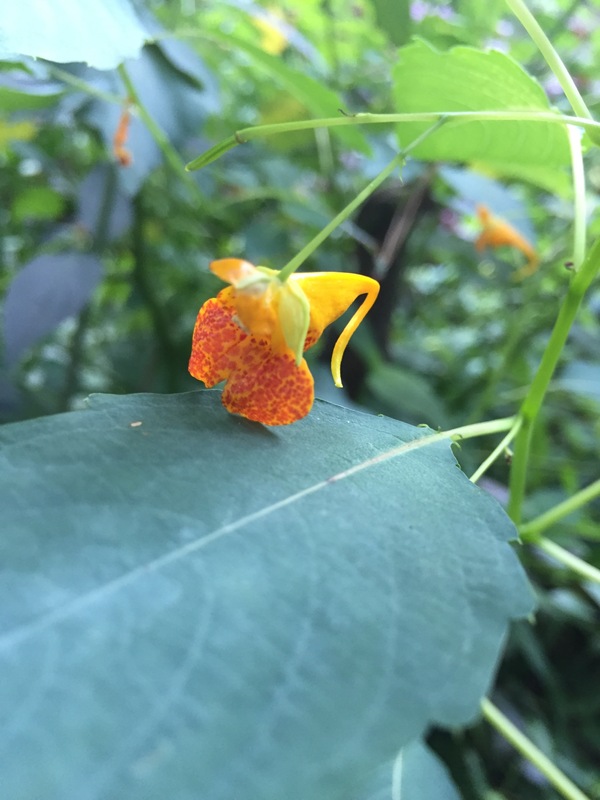 It’s a native impatient which grows in moist lowlands such as along streams. 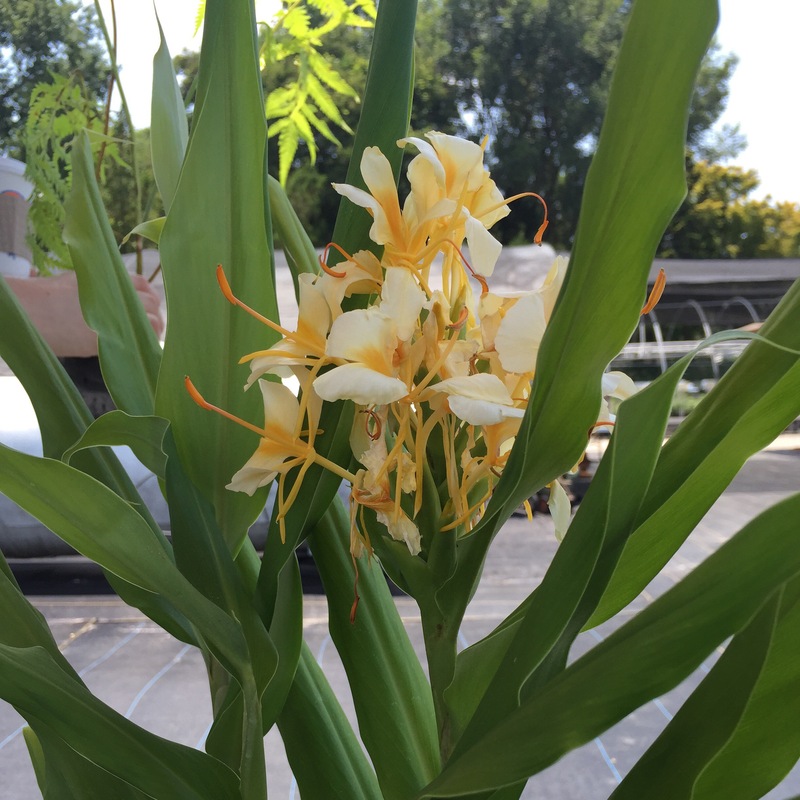 I placed it behind my small lily pond where it would receive plenty of splashed water from the pond. It grows to almost four feet and is know to be a generous reseeder to the point of becoming a weed. We will see! One of my favorite memories of Summer and growing up on Bouge Banks on the coast of North Carolina is homemade ice cream. 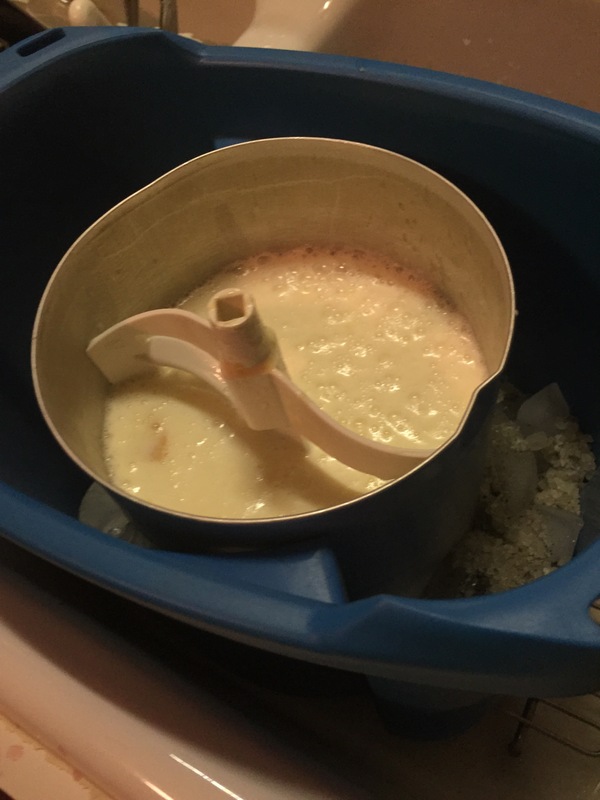 The hum of the ice cream maker and the anticipation of the 25 minutes of watching the paddle going around in the canister just makes it all more exciting! 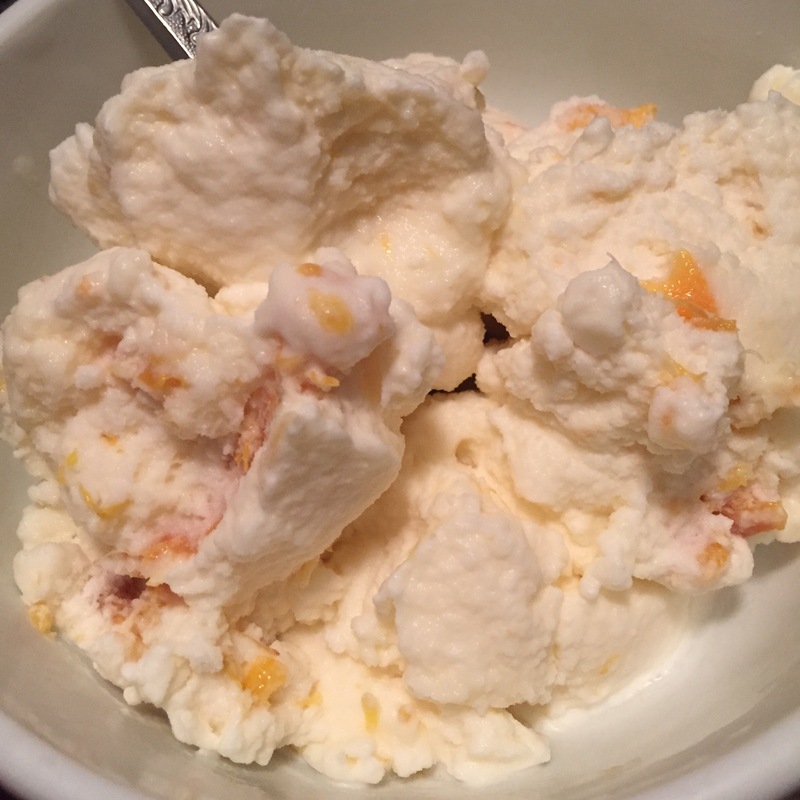 I usually make a simple honey ice cream but since it is peach season I was looking for a good recipe. 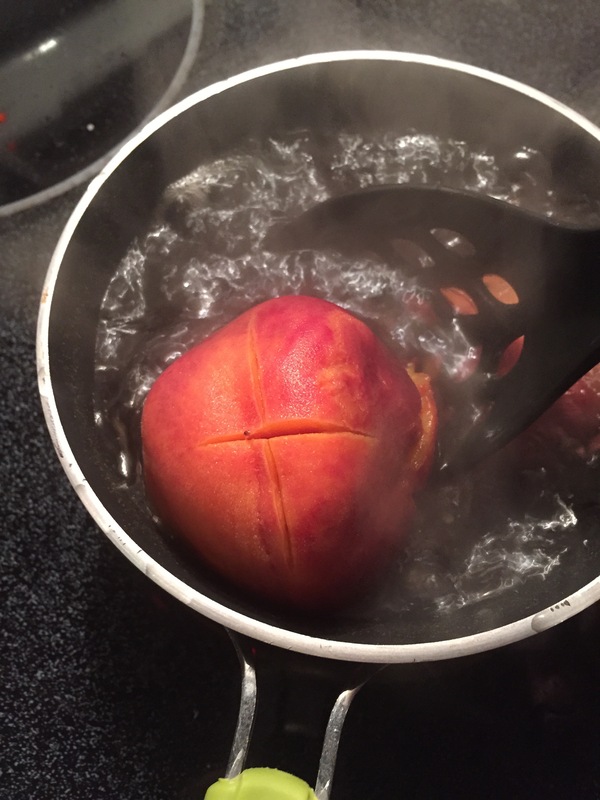 To peel the peaches- cut an X in the bottom of 3 to 4 peaches ( about 1 pound) and drop them in boilng water. Once the skin begins to pull away drop them in ice cold water. Once they have cooled the skin will peel off easily. Combine the peaches and 3/4 cup sugar in a medium saucepan and cook over medium heat until caramelized and syrupy. Let cool completely. Meanwhile,combine 1 cup whole milk and 1.5 cups heavy cream in a medium sauce pan along with a vanilla pod (or a teaspoon of vanilla extract) and simmer over medium stiring occasionally. Remove from heat once it becomes thick enough to coat the back of a wooden spoon. Combine the cooked peaches and the custard and mix throughly. 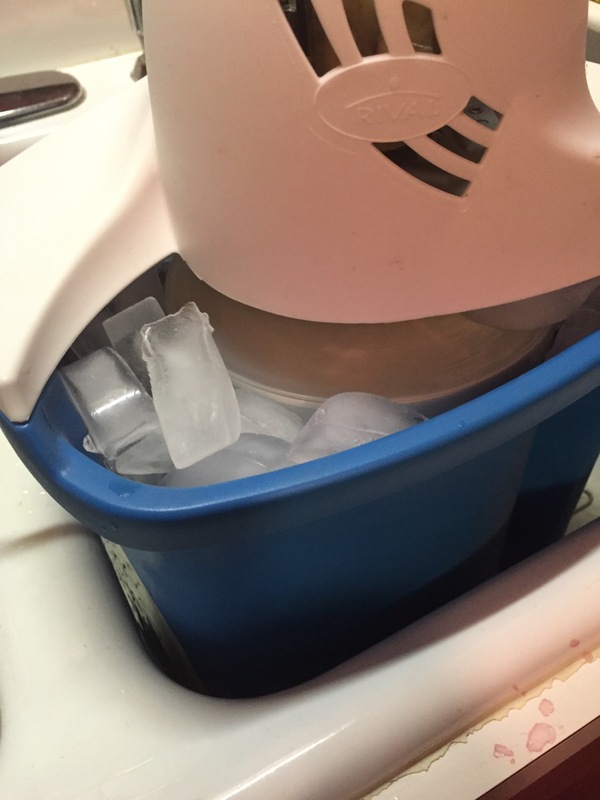 Pour into the ice cream maker canister and add whole milk up to the full line. Add layers of ice and salt according to the instructions. You will need to replenish the ice once or twice. 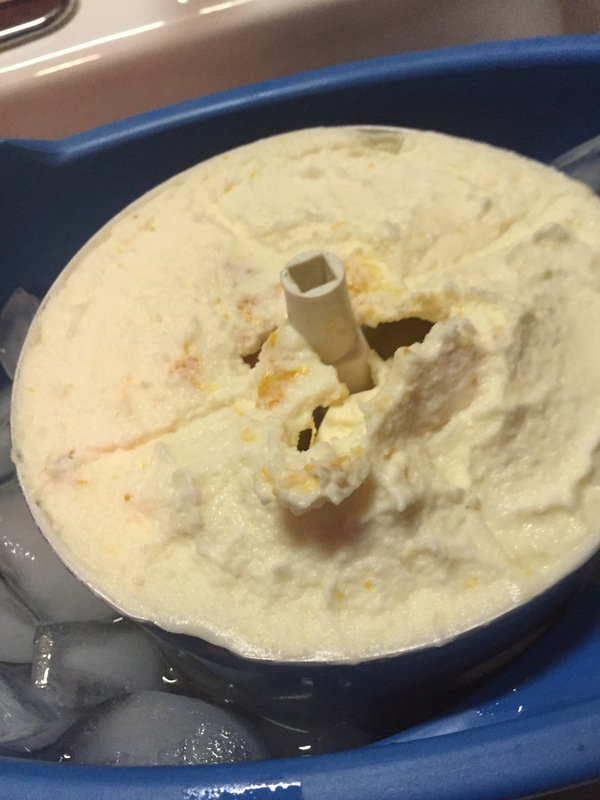 When you hear the motor struggling and slowing you may also notice the motor shaking- the ice cream is becoming frozen and thick! 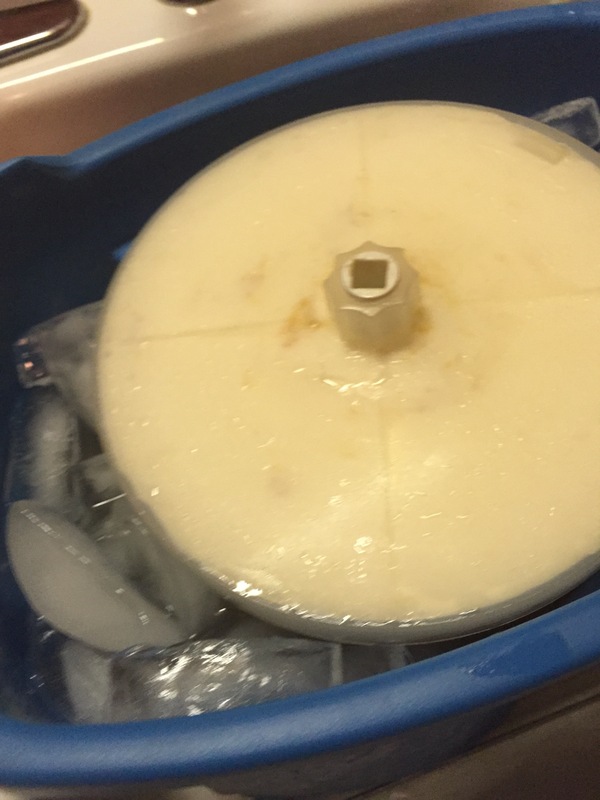 The motor will stop when it is frozen. Unplug it immediately so the motor doesn’t burn! 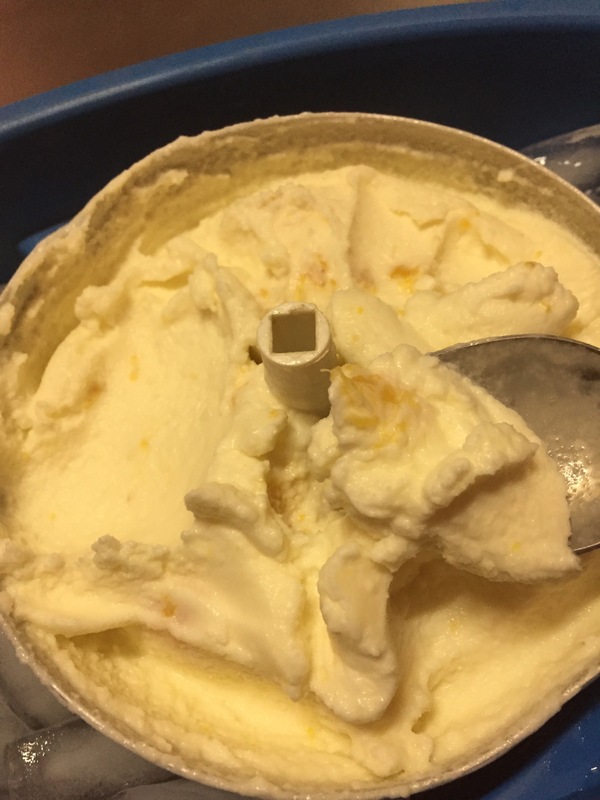 You can see through the clear lid if the custard is frozen. Remove the lid and check the mixture. And I suggest test tasting. 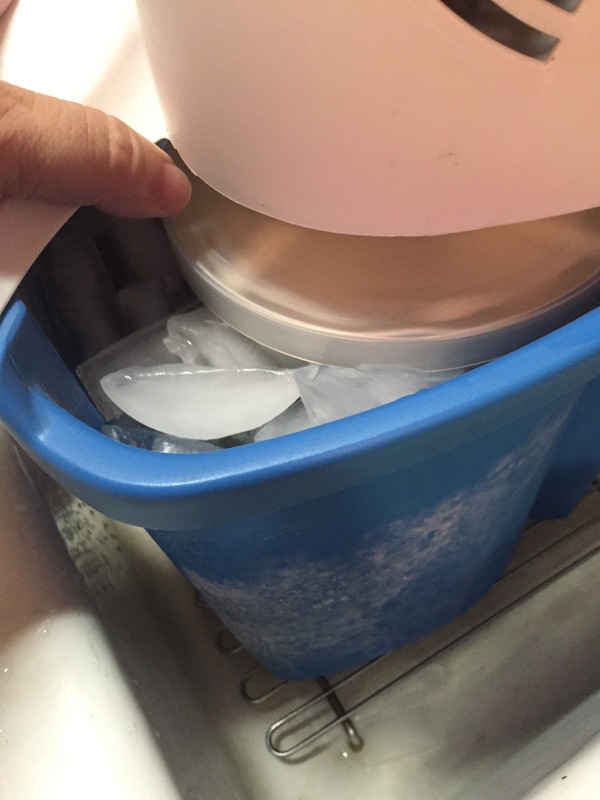 Put the lid back on canister and cover with ice and then a dish towel or cloth and allow it to harden for a few hours. Of course, you may eat it right away is you are making it while you are grilling or cooking dinner or spoon it into containers and place in the freezer for later. I love it fresh from the ice maker as soft serve but it is just as fine later in the week as a harder ice cream from the freezer! 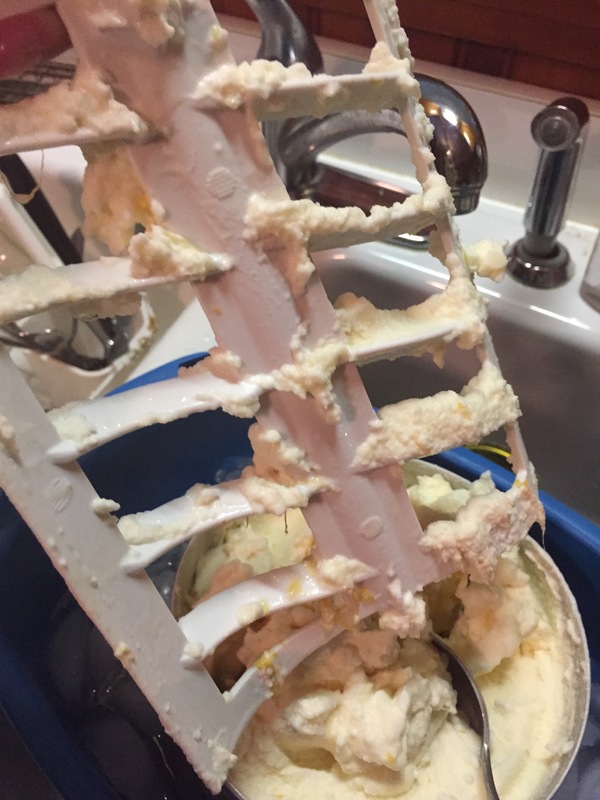 We always use to fight over the paddle or beater because the coldest ice cream was frozen to it! 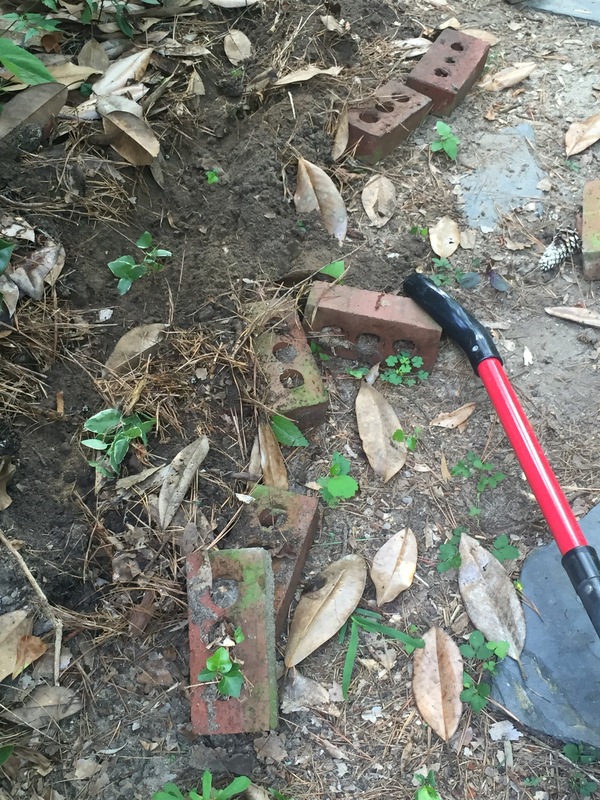 The straightening and realigning of the old brick was going well– until I hit the bee colony! No stings but if my neighbors were watching they probably thought I had done gone crazy!